Quiet Oaks has three guest rooms. 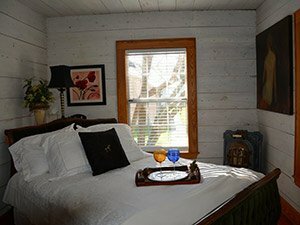 The Athena Room and Renoir Room are found on the main floor of our Gulf Coast Bed and Breakfast and share a private area with a beautifully decorated bathroom, that has an antique claw foot tub and pedestal sink. The Athena Room was inspired by a beautiful portrait that hangs on the wall above a French ceramic fireplace. The queen bed and armoire are also from France. This room has three large windows that look out over the front grounds. The Renoir Room was inspired by one of the artists’ famous paintings that hangs in the room. 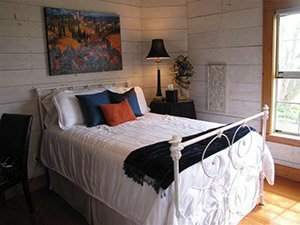 This room has a full size antique iron bed with four large windows that allow for light and peace filled scenery to fill the room. In the spring and fall, when the windows and doors are open, the birds sing their songs incessantly. If you enjoy the sounds of nature, visit Quiet Oaks in the spring and fall! 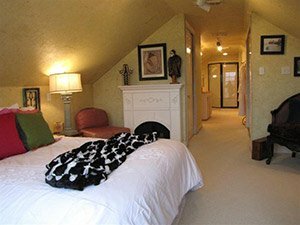 The Ensuite, the third guest room, is a loft that takes up this Danbury Inn's whole upper floor. It has a garden tub, glass shower and a relaxed sitting area with a queen bed overlooking the countryside. This is the most sought out room by guests for its privacy and luxurious setting. All the rooms have luxury robes and linens, a small refrigerator, hair blowers, bottled water and wifi. A coffee cart is placed outside each room, 30 minutes prior to breakfast. Some guests leisurely sip while others stroll around the property with coffee in hand, enjoying the simple pleasures of country life. Breakfasts are all of gourmet quality and also take in food restrictions that a guest may have. Guests have commented on how quiet it is and how comfortable the linens and beds are.